Although these fantastic features are commonly thought to represent perhaps tens of thousands of years or more of groundwater action,1 there is much evidence that they can form rapidly under certain conditions. For example, Sequoyah Caverns, south of Chattanooga at Valley Head, Alabama, has fast-growing formations. Director of the caverns, Clark Byers, cemented a clear plastic panel in front of some stalactites in April, 1977, to prevent tourists from breaking them off. In less than 10 years the stalactites grew about 25 centimetres (10 inches or one inch per year). On the ceiling of the cave, animal tracks can be seen, and there are fossils of many marine creatures—plus a bird fossil which looks like a chicken. 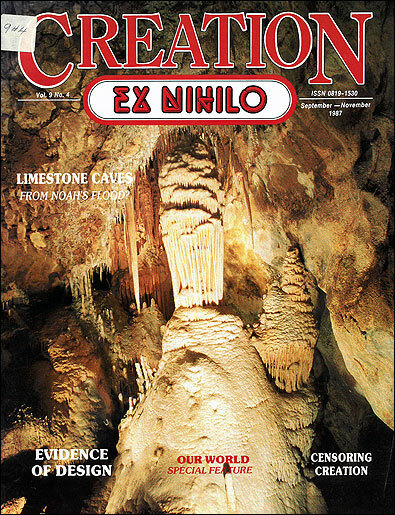 In an interview in 1985, cavern director Byers made no secret of the fact that he believes these fossils are a result of Noah’s Flood. So how fast can stalactites and stalagmites form? Stalactites many centimetres long are sometimes seen under modern-day bridges and in tunnels. Some stalactites have formed quickly in a tunnel in Raccoon Mountain, just west of Chattanooga, Tennessee. The tunnel was blasted through the mountain’s limestone rock to build a power plant in 1977. Water from the plant’s pump-turbines dissolves the limestone, and stalactites form rapidly. At Australia’s Jenolan Caves in New South Wales, a lemonade bottle was placed below a continually active stalactite in the ‘Temple of Baal’ in 1954. In the following 33 years a coating of calcite about three millimetres thick has formed on the bottle. The same amount of deposit has formed since development in 1932 of the Ribbon Cave in the jenolan system. At this time pathways were cut through areas of flowstone. Water flowing down the sides of these cuttings over the past 55 years has built up the current deposit. At jenolan Caves and many other places there are examples of stalactites and stalagmites developing from man-made structures. Like the Lincoln Memorial, the jenolan structures contain cement-mortar which is highly permeable, allowing these formations to develop rapidly. The resultant formation is quite powdery and brittle however. The growth rate of stalactites and stalagmites in many caves today is of course quite slow. But even in such caves the current slow rate of growth cannot be guaranteed to have always been this sluggish. Caves and their formations in tropical areas develop much faster than those in more temperate regions because of higher annual rainfall. But many factors, apart from the obvious unknown rate of water drip in the past, influence growth rate. Stalactites can, and do, grow quickly. A talking point at Temple University in Philadelphia, Pennsylvania, is the fact that stalactites are growing on the cement wall steps between the university’s Anderson Hall and Gladfelter Hall. Right below the stalactites, some stalagmites are forming. Although only several centimetres high, they have all formed since the concrete stairway of Gladfelter Hall was built in May, 1973. There are a number of bridges in Philadelphia which have stalactites growing on them. Some are more than a foot long (30 cm), but many smaller examples have also formed. One bridge was built in 1931 by the City of Philadelphia and Pennsylvania Railroad, so all these formations are less than 56 years old. Formations in the hot water springs in Wyoming’s Yellowstone National Park grow about 2.5 cm (one inch) per year. And there are many examples of rainwater tanks in country areas of Australia that have stalactites growing on them. Because of the evidence for fast-growing stalactites now becoming available, we can safely conclude that the world’s beautiful limestone cave formations may not have needed countless thousands of years to form. These spectacular formations could have formed quite rapidly in just a few thousand years—a time framework consistent with the view that they were formed during the closing stages of, and after, the worldwide Flood of Noah’s time. Encyclopedia Americana, Americana Corporation, Danbury (Connecticut), 1978, Vol. 25, p. 570. Mason Sutherland, Carlsbad Caverns in Color, National Geographic, October, 1953, p. 442. John C. Whitcomb, Jr, The World That Perished, Baker Book House, Grand Rapids, Michigan, 1973, pp. 114–115.